Platforms like Facebook and Instagram provide an incredible marketing opportunity for real estate agents, yet most of us treat social media forums like the modern-day classifieds, posting ads for our businesses rather than making an effort to connect with people on a personal level. If you really want to leverage social platforms as a conversion tool, the key is to stop advertising and start storytelling. And we all have the necessary tools to tell stories through video—with the camera on our phones. Cielo de la Paz is an award-winning photographer, filmmaker, entrepreneur, instructor and speaker. Her Smartphone videographer classes and iPhone Video Toolkit have helped thousands of bloggers, solopreneurs, business owners and nonprofits tell their stories—using nothing but their smartphones. Cielo teaches courses on iPhone videography at Stanford, for private firms and at conference workshops, and her work has been featured in Business Insider, USA Today, Cult of Mac and Buzzfeed. 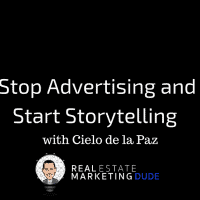 Today, Cielo sits down with me to discuss the art of incorporating storytelling into video. She walks us through the structure of a story, explaining why people are more likely to remember stories over data. Cielo discusses the value of authenticity on social media, how often you should be posting on different platforms, and why the length of a video depends on its content. Listen in for Cielo’s insight on the best tools to use to record and edit smartphone video and learn why consistency is more important than perfection! Visit Cielo’s website and download her free iPhone video resource kit at thestoryographist.com. Check out her Instagram game at instagram.com/theStoryographist, or find her on YouTube at youtube.com/channel/UCV7uz019pNswO6DLD4Nhlkg.